You may have heard of the Lincoln-Douglas debates, aka the Great Debates of 1858. Yes, this is history and there may be a quiz at the end so pay attention. Abraham Lincoln and the incumbent Senator from Illinois, Stephen A. Douglas, held a series of debates around the state trying to sway voters on the important issues of the day. Each hoped their party would control the state legislature, as US Senators were chosen by the legislature, not by popular vote. Lincoln was well-received at the debates, but Douglas was elected Senator. We know how it turned out for Lincoln two years later. 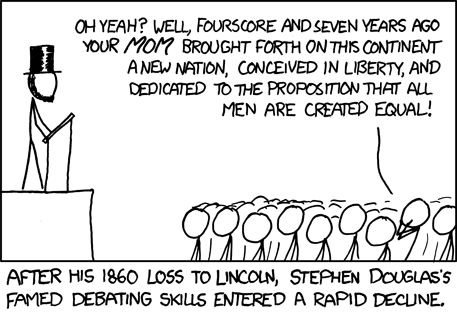 Now Lincoln-Douglas debates are mostly a high school competition. They are “values” debates where students often argue the greater good. “Solvency” is not an issue. A debater does not have to know how to implement a solution, just should be better for society. Of course, he/she will attempt to bring into evidence material from authoritative sources to bolster his/her position. One of the suggested topics for the coming year is Resolved: Civil disobedience in a democracy is morally justified. There is no need to say how this should be applied, but that there are situations when it should or could be. Historical examples would provide support. Law and order arguments may be common on the negative. These debates, like the Lincoln-Douglas debates, are one-on-one. The first speaker has a set time. The second speaker a slightly longer period, then the first speaker gets a rebuttal interval. Total speaking times end up the same. The first speaker may have a plan. The second speaker may have a counter-plan or could argue that no plan is reasonable under the resolution. Shouting, name calling, unsupported positions all result in a ballot for the opposition by the judge. Contestants must research, write, think, and propose. Obviously, acting like modern-day politicians would not produce a winner. Two man team debate, also known as Policy Debate, will propose a resolution where the tactic not only includes interpreting the resolution but also implementing a solution. Some debaters may have so many points to make that they speak quickly. The judge will usually take notes to be sure that the speakers arguments flow logically from point-to-point. Both speakers on each side of the debate topic make a presentation, both are cross-examined. Then each speaks in rebuttal. In many leagues, constructives are 8 -minutes, cross-examinations are 3-minutes, and rebuttals are 5-minutes long. A topic for next season’s two-man debate will be Resolved: The United States federal government should substantially reduce its restrictions on legal immigration to the United States. 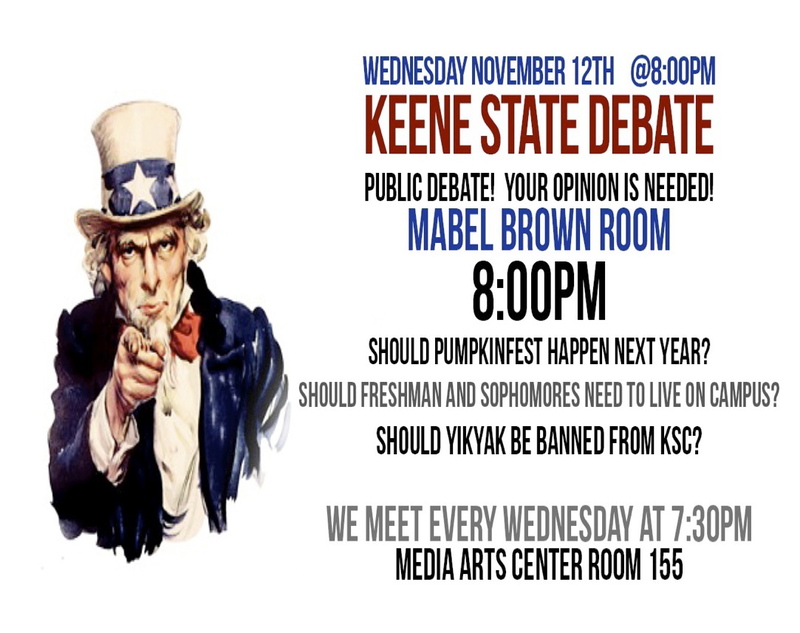 The topics for the debate season are often timely and include something prominently in the news. Debaters must research both sides of the issue as they will be called upon to be on the affirmative or negative, depending on the debate or round within a debate. In mid-summer, debaters are already starting to study the issues and gather evidence pro and con. 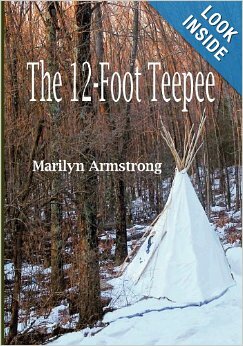 There will be no flippant remarks, insults of opponents, or made up evidence. General and stereotypical comments mean nothing without support. Judges will dismiss these comments. and opponents are wise to challenge them. Because there are obvious “stock issues” implied with any current events topic, it is incumbent upon the debaters to deal with these intelligently. Bombast and supposition will not do. Instead, they must deal with the significance of the issue, solvency of the plan they present, the harms of the status quo or the affirmative plan, and the advantages of one side along with disadvantages of the other. A key part of any debate is “Topicality.” With time to fill in rebuttals and possibly cross examinations too, it becomes important to stay on topic. With an audience of debaters and judges taking notes, you can not stray into areas that are “Extra Topical.” There are no random viewers waiting for a debater to pull out stock arguments on other topics or to launch into inane attacks on the opponent. It’s just critical thinkers judging the merits of the debate. Why do we bring you this small lesson in the fine art of debate? Perhaps you have noticed that debate is a lost art in the political arena, television news shows, and especially social media. 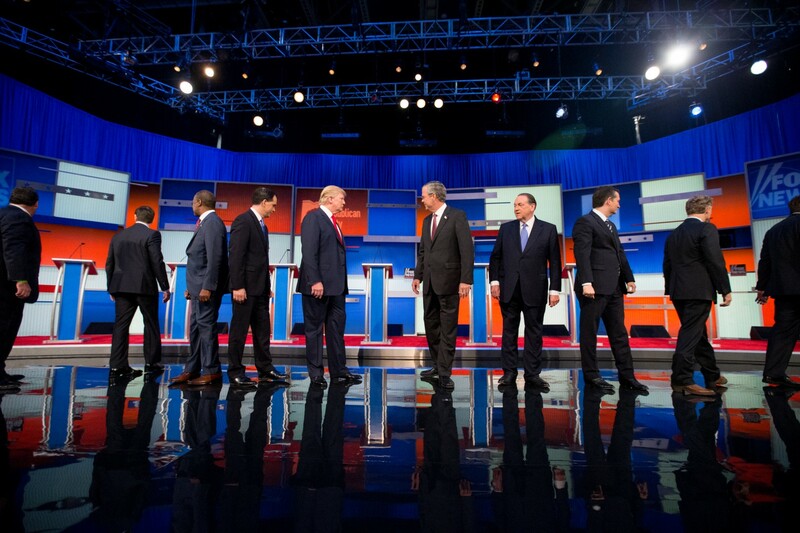 In the last election, you saw one party presenting something other than primary debates. Even as an entertainment show, it was generally lacking in substance. The other side had two candidates who actually seemed to study the topics, but they also found time to present “extra-topical” discussion points. The presidential “debates” that followed frequently strayed off topic. One candidate spent time talking about other administrations rather than what he would do as president. The attempt to belittle your opponent through insults to family and associates may influence some viewers, but it would not work well with debate judges. On my Facebook news feed, I see “discussions” of a social or political nature often degenerate into a series of personal attacks and Extra-Topical points. One friend often posts news articles on current social issues. A person I am acquainted with will usually make a comment on sanctuary cities. If I point out the topic has nothing to do with these cities, he tells me to wake up! For him, that is the only topic which really matters. There is no staying on topic sometimes. It is particularly frustrating if you are a debate coach or judge. I actually get physically ill thinking about the upcoming election and debates. And this isn’t even presidential. I may need to be in a chemically-induced coma for the next presidential round. Hopefully the next round is better.